Ballroom medal tests are graded exams where the student is partnered by their teacher or an advanced student. 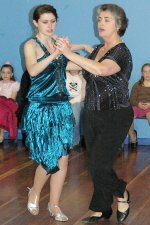 Penrith Ballroom Dance follows the Australian National Dance Association (ANDA) medal program. This program offers all styles ie Modern, Latin American and New Vogue, and all grades from Elementary up to Oscar to all ages - junior and senior. Adults wishing to take medals would require private lessons, starting with at least one half-hour lesson per week. Our Tuesday afternoon children's classes follow the medal program. Private lessons are also available to children if preferred. Penrith Ballroom Dance holds medal tests twice a year - in June and December.